When the water in a wet pipe fire sprinkler system freezes, it typically expands 10%or more. This can cause blockages in the pipe and in some instances, cause pipes to crack or burst. To prevent this avoidable event from occurring, NFPA 13 2019 version permits the use of energy efficient electric heat trace to be used with an insulated and weatherproof jacket so that the sprinkler pipe is maintained at or above the required 40°F. The electric heat trace systems for fire sprinkler freeze protection that we design, and supply are listed and approved. The approval is for the latest NFPA 13, IEEE 515.1 and UL 515A for installation of heat cable on wet fire sprinkler piping. The excerpt from the NFPA 2019 regulations that pertains specifically to freeze protection is listed below. 16.4.1.1.1 The requirements of 16.4.1.1 shall not apply where alternate methods of freeze prevention are provided in accordance with one of the methods described in 16.4.1.2 through 16.4.1.4.1. 16.4.1.2 Unheated areas shall be permitted to be protected by antifreeze systems or by other systems specifically listed for the purpose. 16.4.1.4 Listed heat-tracing systems shall be permitted in accordance with 16.4.1.4.1 and 16.4.1.4.2. 16.4.1.5 Water-filled piping shall be permitted to be installed in areas where the temperature is less than 40°F (4°C) when heat loss calculations performed by a professional engineer verify that the system will not freeze. The full list of NFPA codes and standards can be found at NFPA.org. Electric heat trace systems must be combined with thermal insulation to limit heat loss in the system to provide the most energy efficient temperature maintenance. IEEE 515.1 has very clear instructions for insulation requirements for fire sprinkler systems. IEEE 515.1 also has very specific control requirements for pipe freeze protection systems that cover everything from backup power contact or types to being permanently connected to the power supply. The most unique aspect of this requirements is its ability to provide audible/visual alarms along with being able to communicate with the fire alarm control panel. The ITC-FS Series Intellitrace Controller from Chromalox is one of the very few on the market that meets all of the most current requirements and have passed the extensive testing of the UL515A standard. Being one of the industry leaders in heat trace products, Chromalox has the widest array of self-regulating heat trace. Self-regulating heat trace is used in these applications because it will efficiently self-adjust its heat output to changes in pipe temperature along the entire length of the line. The SRF cable is available in 3, 5, 8, and 10 w/ft and in 120V or 208-277V. This gives us the flexibility to design the most cost-effective system to install and operate for our customers. At Liberty Electric Products, we have over 30 years of designing systems for pipe freeze protection of sprinkler systems. Being in the Northeast, it is key that these systems are designed to be able to withstand the harsh cold environments in everything from parking garages, loading docks, atriums, and many other applications. Please contact us directly and one of our sales engineers can visit a job site or review your drawings to get a project started. 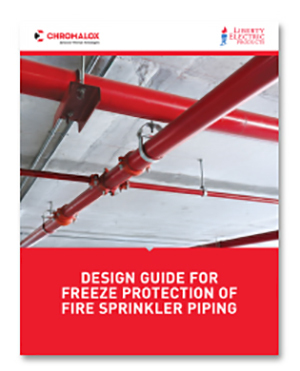 Download Chromalox’s Freeze Protection of Fire Sprinkler Piping Design Guide to learn 5 design tips to help you when designing a heat trace system for your fire sprinkler piping.